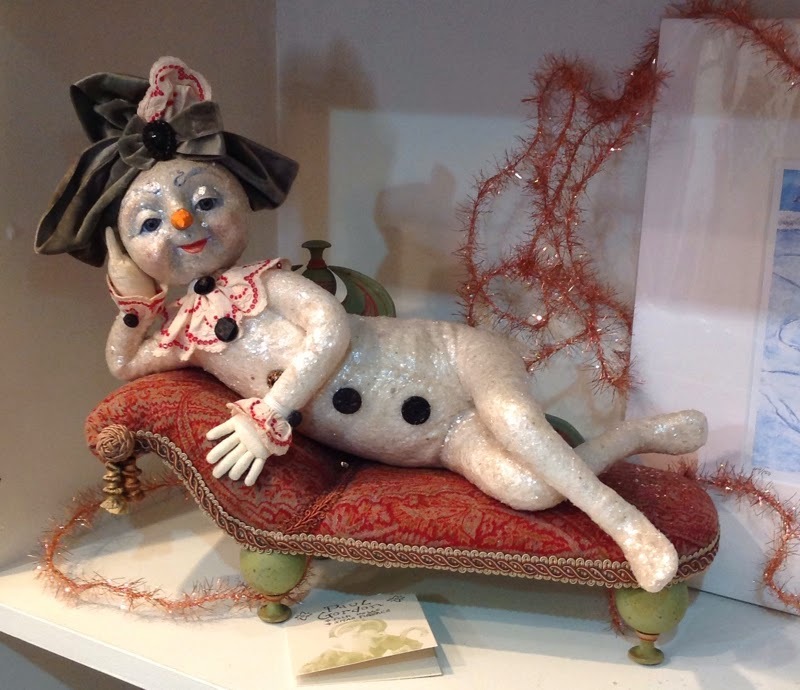 This adorable reclining snowlady sculpture by folk artist Paul Gordon is a pretty good representation of what I've been doing for the last several weeks. All she needs is an iPad, a Pinterest account and a stack of decorating books! After all the hustle and bustle of managing Cynthia Crane's Pottery and Paintings biz last fall, I've given myself a nice long vacation to catch up on some projects in my home. 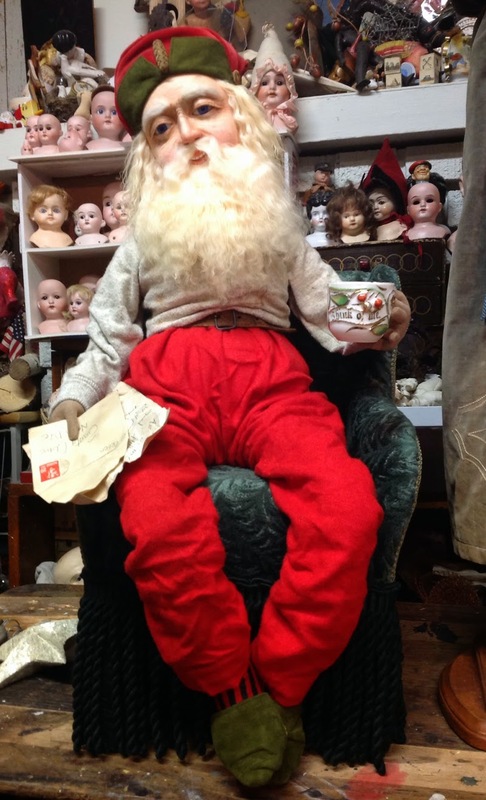 But more on that later - this post is all about Paul Gordon and his amazing folk art, his fantastic studio, his fabulous home AND his yearly art show "Friends In Christmas". 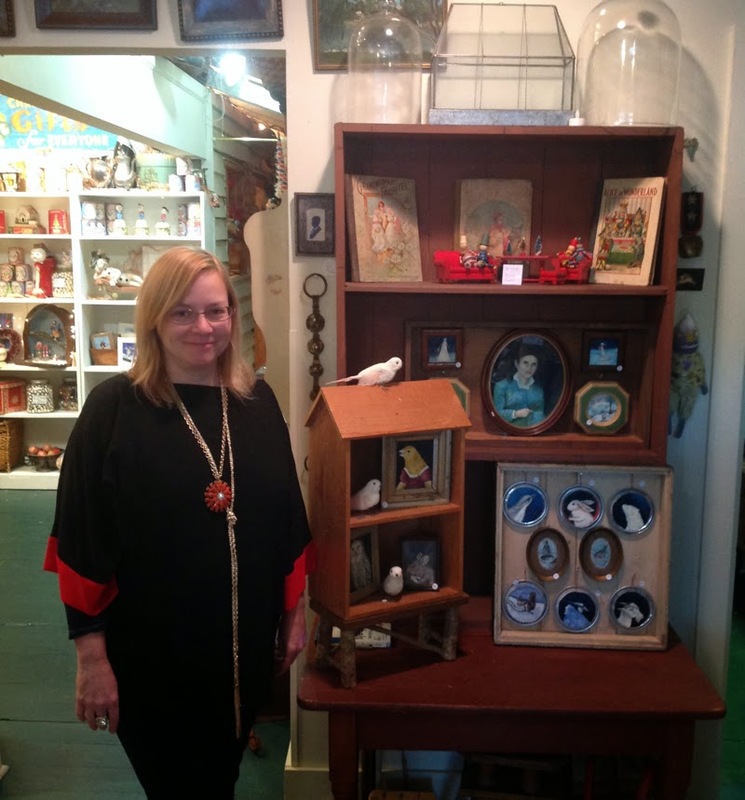 If you have been following my blog for a while you know that not long ago I moved to a very small town after residing for over 32 yrs in a large city with a huge and very diverse art community. I have indeed met some very talented artists here in my new area, but none quite so uniquely talented as Contemporary Folk Artist Paul Gordon. 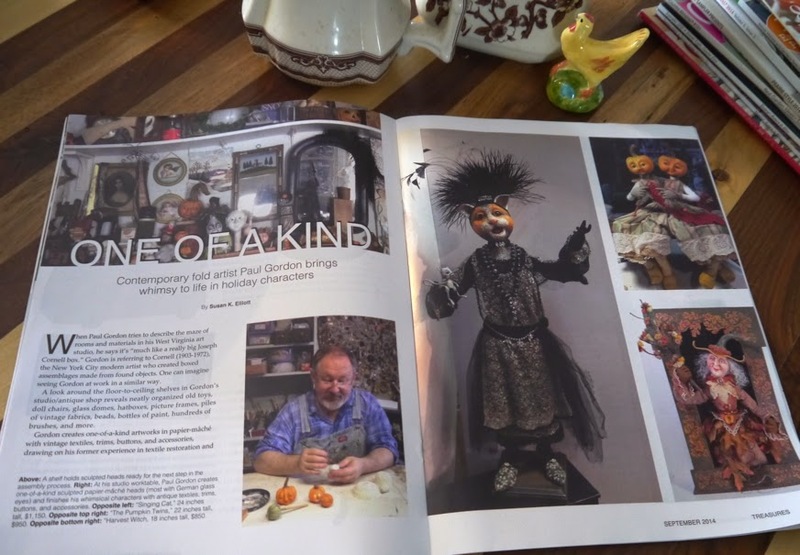 Imagine my surprise when quite by accident in early 2014 I stumbled upon a blog article on Paul and the wonderful art show he puts on each November in his local studio and antiques shop. Oh, my goodness! 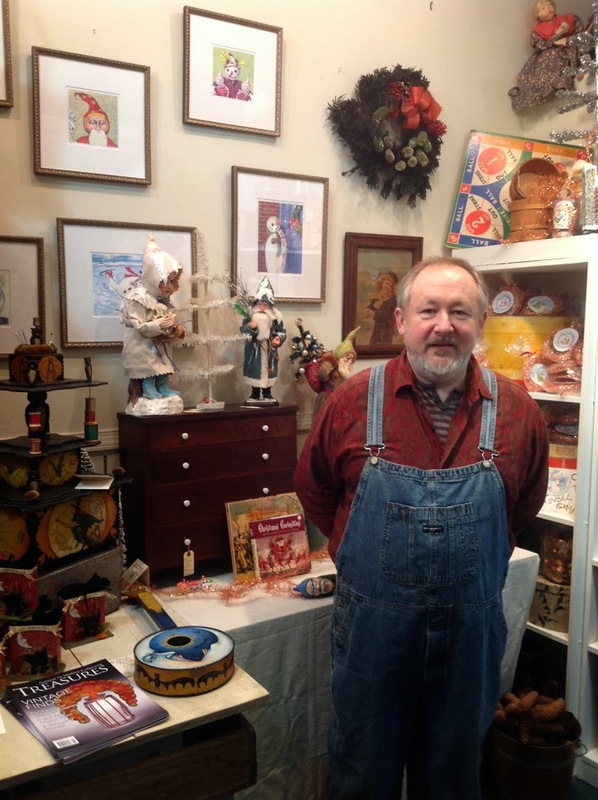 How delighted was I to learn that an artist of such renown as Paul - who has long been well known by folk art collectors near and far - actually lives and works right here in my little town. But to have the opportunity to participate in his small but exclusive show was such a joy! And to be in the company of Paul's hand-picked group of extremely friendly and talented artists was truly wonderful! 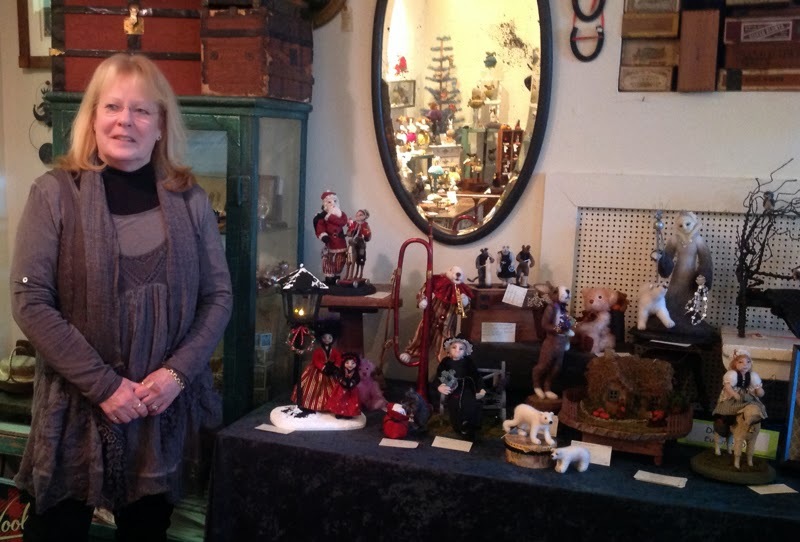 Deborah Hartwick of Heartwells has been making her delightful velvet creations since the early '80s. 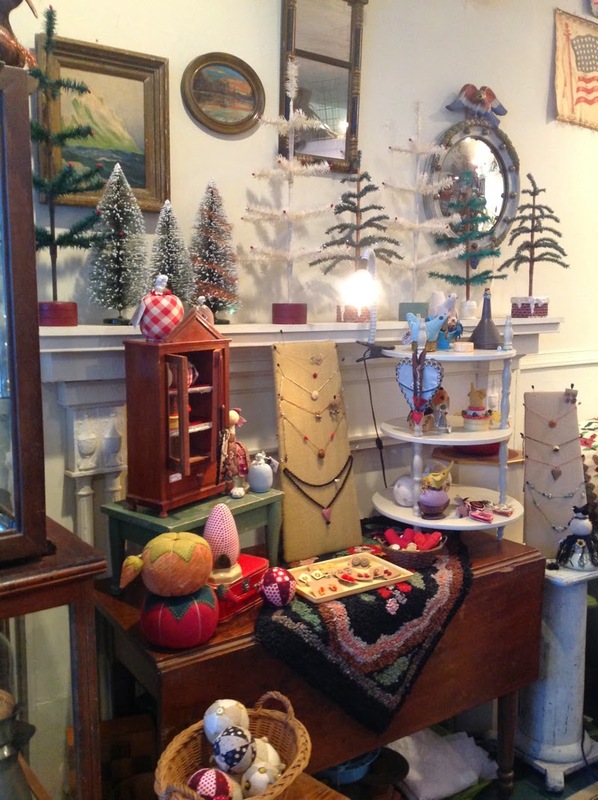 Heartwells - Pin Cushions and other Soft Sculptures. 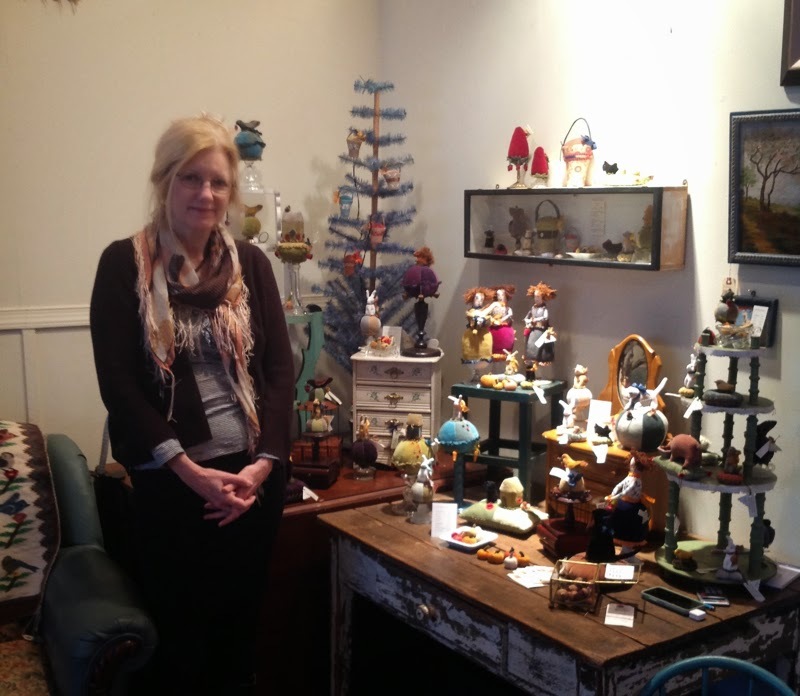 Kim Stout and her lovely Ceramic and Soft Sculptures. Kim makes the sweetest Jewelry and Strawberry Buttons, among other things. And here is Stacey Bear with her precious artwork. 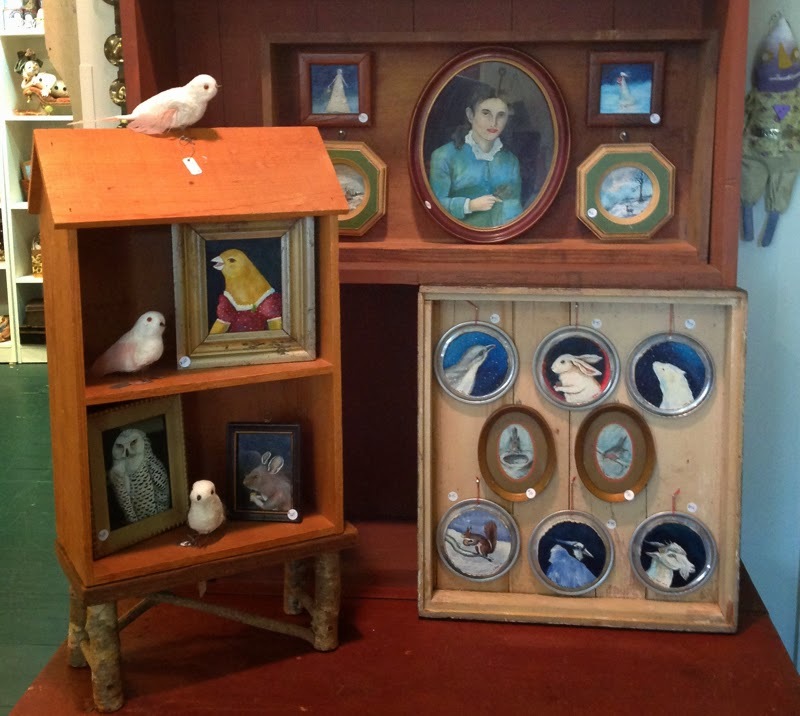 I adored Stacey's Miniature Paintings. I wanted them all! 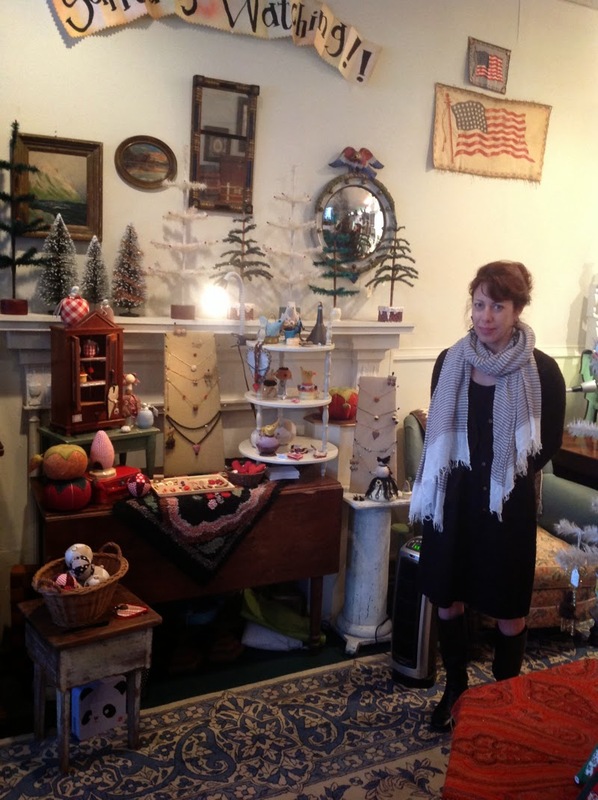 Deanna Ellis and her incredible sculptures. These were truly amazing! Santa Sculpture by Paul Gordon. 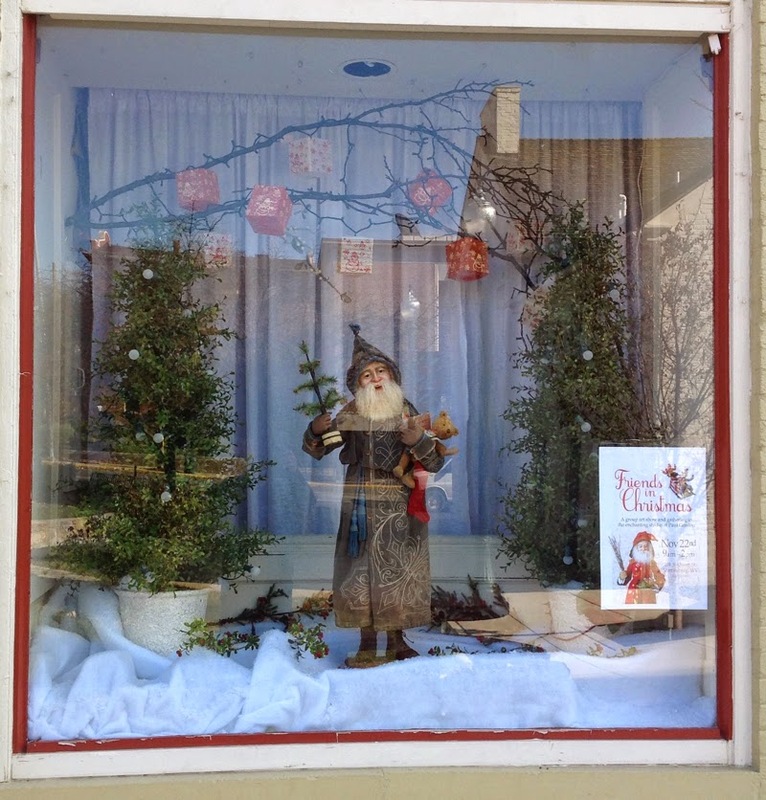 And of course Paul was there with his enchanting and wonderful holiday characters. Long before the show opened on that Saturday morning eager shoppers were lined up at the door, all hoping for first dibs on either the fabulous Santa sculpture in the window or any one of Paul's other amazing creations. He actually has collectors who come to his show from as far away as the west coast. His work has been licensed by major gift manufactures and can be seen in several galleries and museums nationwide, as well as at the Ghoultide Gatherings show each October in Chelsea, Michigan. 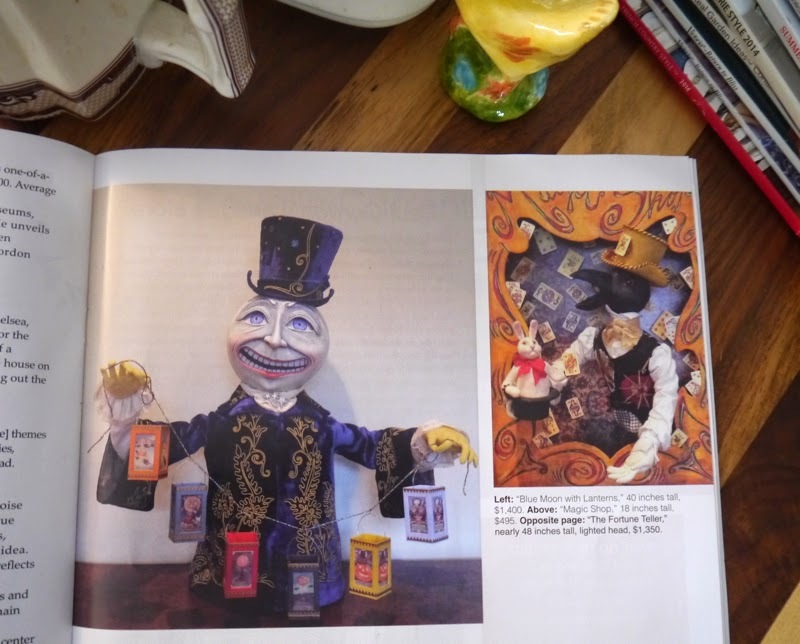 Pauls work has also been featured in magazines, as shown in this recent issues of Treasures. Yes, that's Paul, truly "One of a Kind". How imaginative! You just know he's having so much fun making these! Paul's creations clearly reflect his former career in the textile and fashion industry. After forming the head and body, he brings a character to life by drawing from his ginormous collection of vintage textiles, trims, buttons and various accoutrements, all neatly stored in his vast studio space. Room upon room (13 to be exact) are filled floor to ceiling with anything and everything he might need in order to outfit each character. And if his studio isn't enough to make an artist and vintage-lover green with envy, his home - filled with the most amazing collections - is certainly a joy to behold! 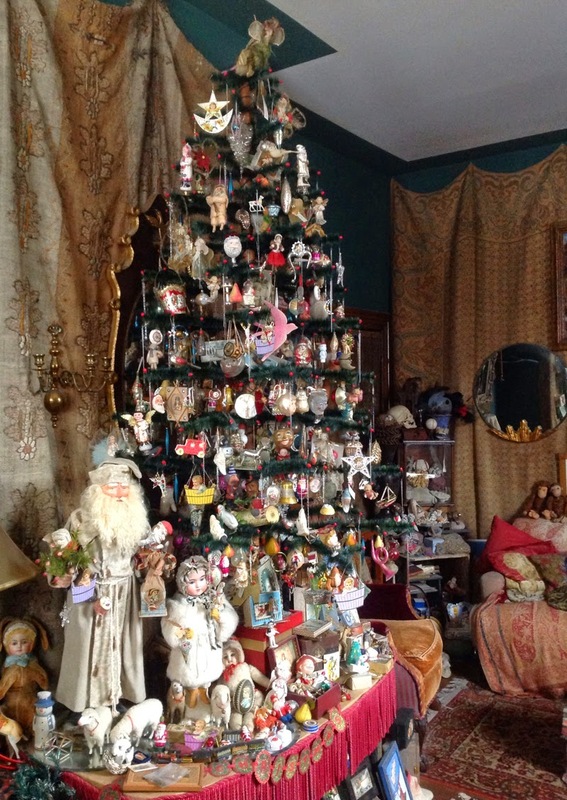 Paul's Christmas Tree Room, which remains on display year round. 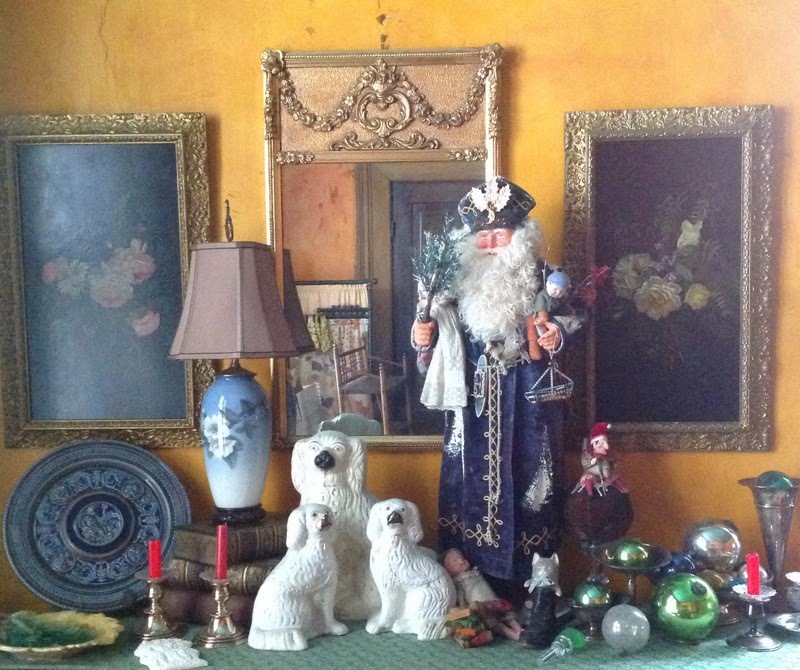 A lovely vignette in Paul's fabulous home. 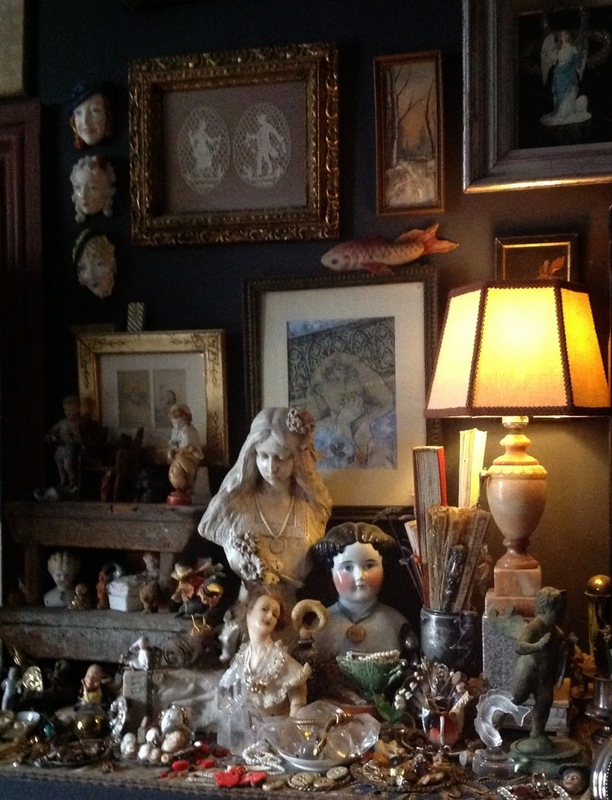 Many, many collections like these can be seen throughout Paul's home. If you'd like information on how/where to buy from Paul or any of the others artists here, just contact me by email as most of these artists currently do not sell online. So now that I have once again flexed my blogging muscles be sure to check back again in a few days for my post in Vicki's 2 Bags Full yearly Grow Your Blog party! How good to see you dear Cynthia. What a wonderful show for you to have been a part of. Thanks for sharing Paul's works here and the other artist's too. What a lovely experience for you! Your work is equally wonderful and you are so very talented. 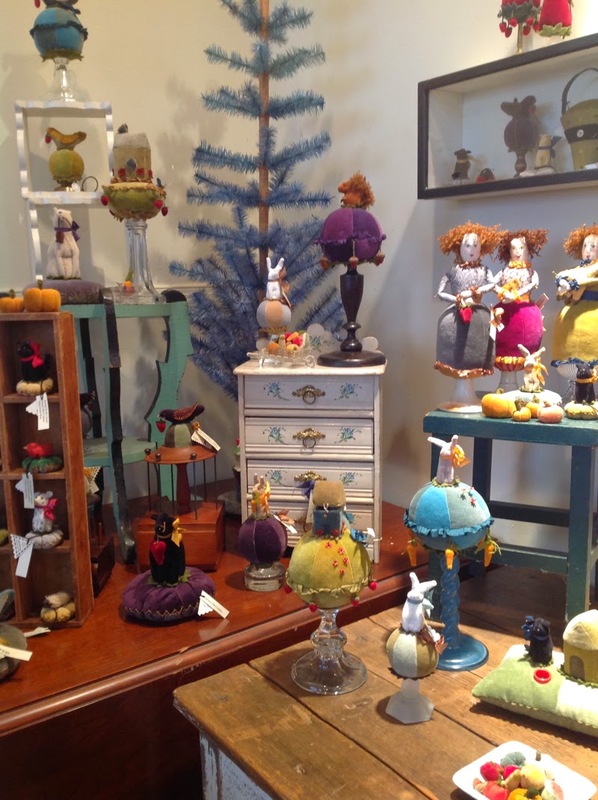 I would have loved to see those great pincushions made by Kim and Deborah. I think I need a jolt of face to face inspiration myself! Thanks for your support and friendship. Your a very special lady! So wonderful! What a great show, thank you for sharing. Well all I can say girlfriend is that THEY should all be SO proud to be in your company!! Everyone -- such talented artists-- it must have been an amazing gathering of talent on display at the show! Ahhhh the party--- it's going to be a great one. Can't wait!! What an honor it is to be associated with all this talent! I enjoyed the photos and the info about Paul Gordon. You do beautiful work yourself. Now others have shared it! Grow Your Blog Party 2015 and a Giveaway Contest!